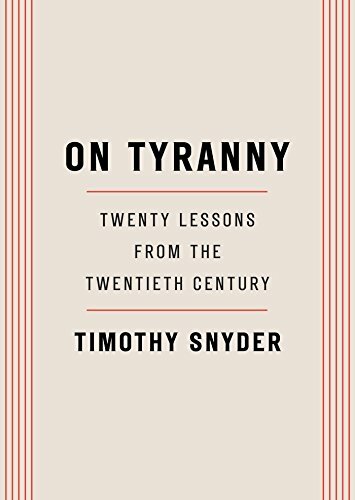 At last weekend's indie book crawl I picked up On Tyranny: Twenty Lessons from the Twentieth Century by Timothy Snyder. Snyder, the Levin Professor of History at Yale University, is also the author of Bloodlands: Europe Between Hitler and Stalin, and Black Earth: the Holocaust as History and Warning. I noticed the book because as an artifact it's a delight. Roughly the size of two packs of playing cards set side by side, it has 126 pages, a Prologue, and 20 chapters, most ranging from 1 to 5 pages. The plain cover has that letter press feel. The typography is gorgeous. The premise of the book is that history can inform our lives. Snyder's deep knowledge of three periods - the rise of the USSR, the rise of Hitler, and the rise of Putin - provides a playbook for tyranny. It's clear that Snyder believes that our current president - whom he never names - is a sort of pre-tyrannical figure. What should we do about it? The book is a quick read. But it's compelling and persuasive. As a librarian, I find at least four of the lessons eerily on point for me, namely: defend institutions. We have got to stop worshiping disruption for disruption's sake, and start building institutions that serve people well. Remember professional ethics is the core of my job these days (director of the Office for Intellectual Freedom). Believe in truth and Investigate both speak to the trustworthiness of librarians as honest information providers. At any rate, this is a modern classic for anyone interested in actually doing something. On Tyranny is available from TimDugganBooks.com, and, of course, your better indie bookstores.